Russian President and Turkish counterpart meet in Moscow in the wake of US decision to withdraw forces from Syria. Russian President Vladimir Putin and his Turkish counterpart, Recep Tayyip Erdogan, met in Moscow on Wednesday and vowed to coordinate their actions more closely in Syria. "Cooperation between Russia and Turkey is a touchstone for Syrian peace and stability," Erdogan said in translated comments at a joint press conference after their talks, which lasted around three hours, reported AFP. "With our Russian friends we intend to strengthen our coordination even more," he added. "We agreed how we'll coordinate our work in the near future," Putin said, calling the talks which included the countries' defense ministers "effective". 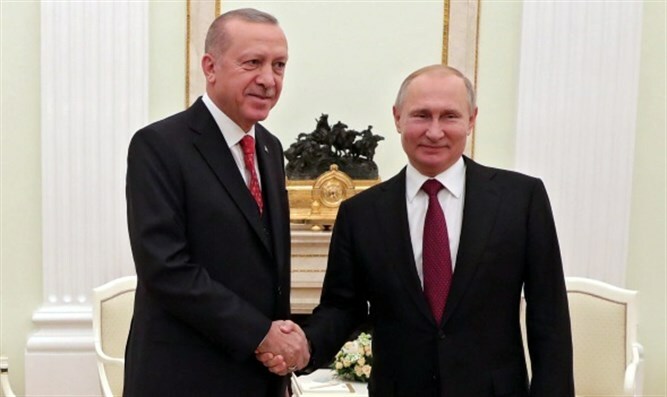 At the start of their meeting in the Kremlin, Putin addressed Erdogan as "dear friend," saying that their countries "work on issues of regional security and actively cooperate on Syria". Erdogan used the same term for Putin and said "our solidarity makes a weighty contribution to the security of the region". The two leaders have been on opposite sides of the Syria conflict: Russia provides critical support to the Syrian government, while Turkey has backed rebel groups fighting President Bashar Al-Assad's forces. However, Ankara and Moscow have been working closely since a 2016 reconciliation deal which ended the crisis. Russia and Turkey have agreed to coordinate ground operations in Syria following US President Donald Trump's surprise announcement last month about pulling 2,000 American troops out of Syria. The announcement of the US withdrawal was reportedly coordinated with Erdogan but had been made against the warning of senior security officials in the Trump administration. Putin said that if carried out, the withdrawal of US troops from northeastern Syria "will be a positive step, it will help stabilize the situation in this restive area". Erdogan had said on Monday he would discuss with Putin the creation of a Turkish-controlled "security zone" in northern Syria, which had been suggested by Trump. Turkey has welcomed Washington's planned withdrawal, but the future of US-backed Kurdish militia forces labelled terrorists by Ankara has upset ties between the two countries. The US’s main ally on the ground fighting the Islamic State (ISIS) in Syria, the Kurdish led Syrian Democratic Forces (SDF), have held emergency talks with Moscow and Damascus over fears that Turkey will use the US withdrawal to launch on offensive. Putin said Wednesday that Russia supports "establishing dialogue between Damascus officials and representatives of the Kurds".